Above photo by Sam Crater. Thanks Sam! 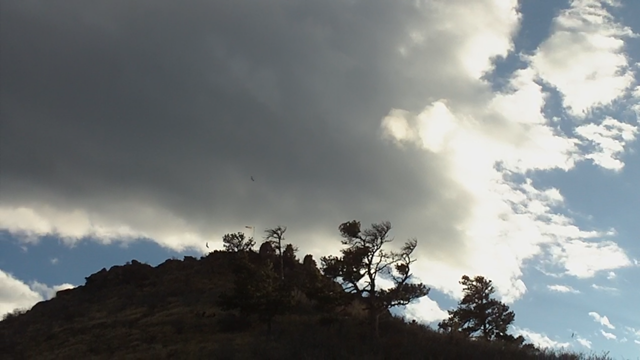 In the below picture, that windsock on top of the hill is blowing over the back… and you can see the zagi’s(barely) soaring the backside, this is terrible. Most everyone went home, save Sam, Andy and I. We were game for a hail mary. 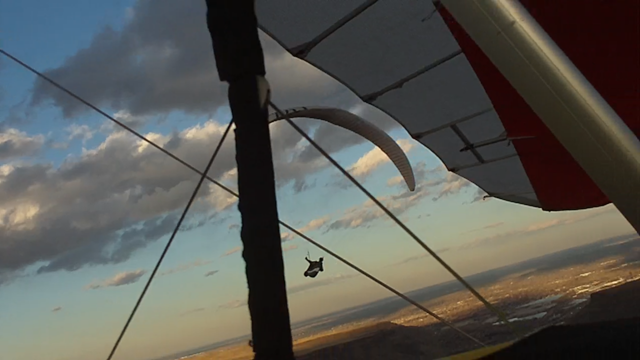 However, as the NW wind increased, our 1% chance of flying was getting whittled down. I started to get pinchy faced about turning down an offer to go sailing on Chatfield Res. 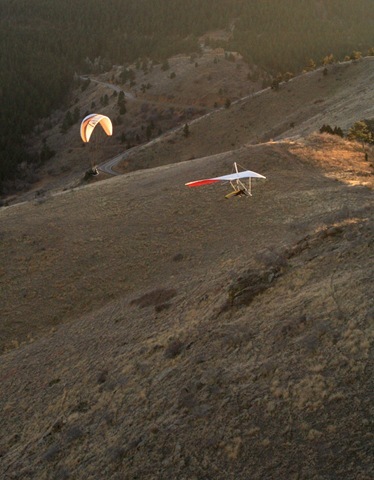 However, if I break down my glider now and try to get home fast, I could be walking down the hill as it turns around and I would be incapable of handling that constructively so I wait. 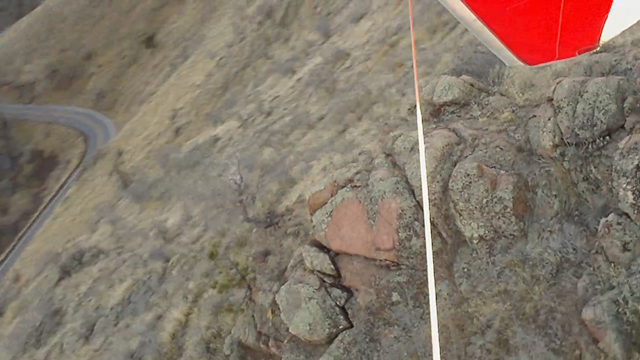 You You really could soar a potato sack on the cliffs behind launch… and the rotor was causing it to blow in a bit. 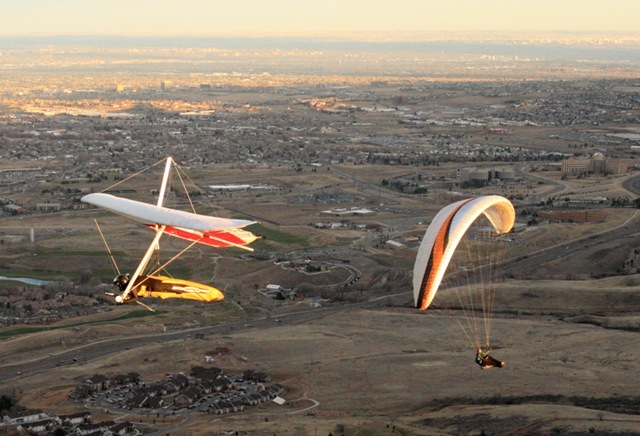 Terribly dangerous conditions if we were college kids with Ebay wings. Anyway, Sam’s new I-phone was the hero of the day. We kept surfing the web for signs of hope and found another pulse of the cold front coming our way. 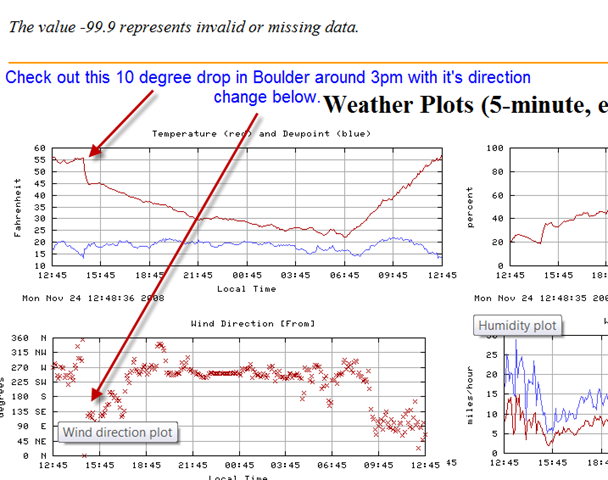 We monitored it’s progress as it hit NCAR (Boulder), and then Eldorado Canyon, and then, finally us! The NE wind that’s ideal for this site was blowing 15-20mph at almost every airport and station we could find out east of us.. as close as 3 miles away for most of the day. In spite of us I’m pretty sure! I guess the front couldn’t wrap into our position until the heat on the front range eased up a bit. So at 3:40 or 4:40pm, the wind switched 180 degrees and bombarded our noses with the smell of cooking hops or barley from the Coors plant. 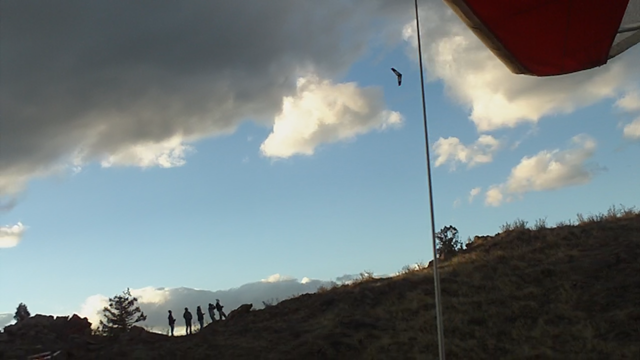 I had to catch my Hang Glider as it started taking flight on it’s own since it’s back was facing the previous west wind. 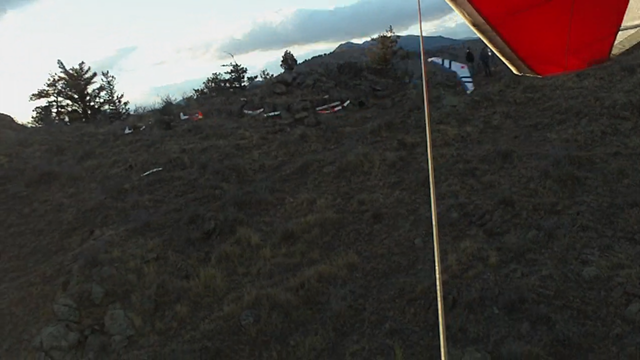 I suited up as fast as I could and launched into the initial push of maybe 16-20mph from the East. 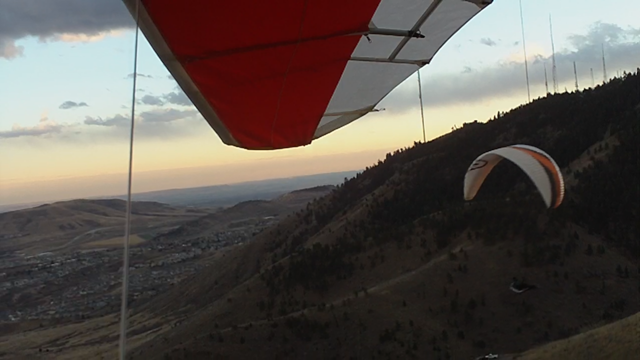 We flew in the narrow/shallow lift band over the S. Bowl for 45 minutes until the ridge lift diminished. Zagi battlers below. I tried not to interfere, but they were in that precious lift band. I love flying through them too, and I hope they don’t mind. It’s hard to resist the urge to dive and circle after a zagi. 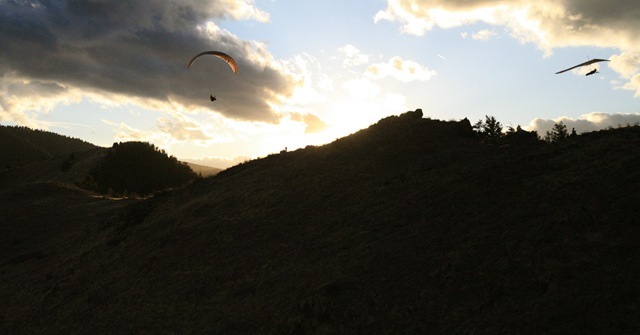 Flying so low and close to the hill and Sam and Andy was brilliant. A hiker guy with a big camera stationed himself on the pivot spot for lots of our low turns and his shots had to be unbelievable as we headed straight for him. Wish I knew who it was. He smiled at me as a couple of my runs at him were just barely above the rock he was standing behind. Even better than the engaging flying was that we got what we came for after it seemed unfathomable… impossible even. 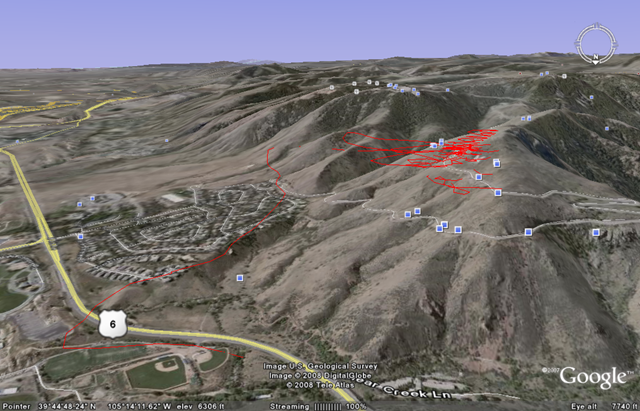 Google Earth Below… Alt still messed up so I’m 200ft above this tracklog. « Ad Astra Per Aspera- "To the stars through adversity"